existence. He created all things. He is in all places. He is Lord of Heaven and Earth. I desire a church in this place where your people may experience my compassion. All those who sincerely ask my help in their work and in their sorrows will know my Mother's Heart in this place." After this encounter with Mary, Juan went to tell the bishop what he had just witnessed. Upon meeting with the bishop, Juan was asked to provide proof for his recent experience as the bishop was very skeptical of the story. Juan was determined to prove his meeting with the Virgin Mary, so he ventured back to find Mary and generate proof for his encounter. However, even though Juan's determination to prove his meeting with the Virgin Mary was strong, he got sidetracked from his mission when he was informed that his uncle was now sick and near death. Saddened by this news, Juan ventured to see his dying uncle. Juan thought this would prevent him from seeing the Virgin Mary again; however, to his surprise, Juan was visited by the Virgin Mary on his way to see his sick uncle. Mary told Juan that his uncle had been cured. What a relief this was to Juan! Mary then requested Juan to return back to their initial meeting place so he could obtain proof of her existence. As instructed, Juan returned and was shocked to find flowers growing in the frozen soil - this was truly a miraculous sight! Juan gathered the flowers in his cloak and immediately took them to the bishop to prove his encounter with Mary. Juan told the bishop what had happened and he opened his cloak to show the flowers he collected from the frozen soil. The flowers that fell to the ground were Castilian roses (which DO NOT grow in Mexico), but to Juan's surprise, the bishop was more focused on something else--a glowing image of the Virgin Mary imprinted inside Juan's cloak! Soon after this miracle, a church was built on the site that Mary had requested. This miracle and church led to thousands of conversions to Christianity. 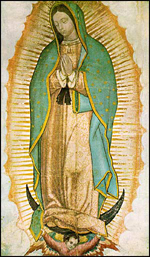 Our Lady of Guadalupe was declared the patroness of the Americas and Juan Diego was canonized on July 31, 2002. Juan Diego's cloak is still in existence and can viewed at the Shrine of the Basilica in Mexico City. The cloak is over 470 years old, yet it mysteriously shows no sign of deterioration or discoloring. An incredible amount of miracles and cures have resulted from the intervention of Our Lady of Guadalupe. The shrine that houses the cloak worn by Juan Diego receives an estimated 10 million visitors each year, making it the most visited church next to the Vatican.